Features: Spring Loaded Action Assassins creed IV 4 black flag pirate hidder blade gauntlet cosplay replica Material: PVC Scale:1: 1 Size: one size Gender: Female, Male, Both Color: Black It's not a weapon just a toy would be a great item to add to any cosplay costume. Great for collectibles and as gift to friends or relatives. Attention: Although the top blade is soft, but avoid to use it towards people's face. Without original Box Package included: 1 x Assassin's Creed 4 Black Flag Pirate Hidden Blade Cosplay Edward Kenway Gauntlet. Assassins creed IV 4 black flag pirate hidder blade gauntlet cosplay replica. Gender: Female, Male, Both. Scale:1: 1. Color: Black. We believe communication will fix problems. Size: one size. Great for collectibles and as gift to friends or relatives. US Free Shipping!!! Best Packing in Gift Box!!! 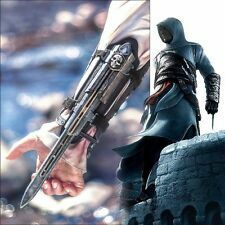 Assassins creed IV 4 black flag pirate hidder blade gauntlet cosplay replica. Scale:1: 1. Pls do understand. Color: Black. Size: one size. Gender: Female, Male, Both. Highly Detailed Replica of Ezio Auditore's Armored Vambrace. 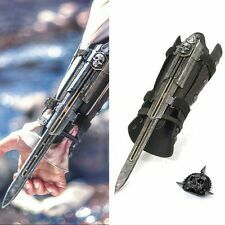 1 x Assassin's Creed Ezio Hidden Blade Auditore Gauntlet Replica. Great for collectibles and as gift to friends or relatives. We believe communication will fix problems. 1 x Assassin's Creed 4 Black Flag Pirate Hidden Blade Cosplay Edward Kenway Gauntlet. 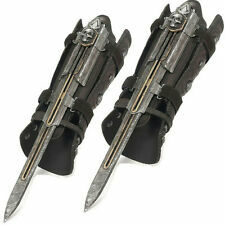 Assassins creed IV 4 black flag pirate hidder blade gauntlet cosplay replica. Gender: Female, Male, Both. Scale:1: 1. Great accessory for Halloween or year-round role play. You should always be careful with giving your information on the internet. So who are we?. We buy all our products direct from the manufacturer. Assassin's Creed Aguilar's Hidden Blade Costume Accessory. I opened the box when I won it in an online constest, but has always just sat in the box on a shelf. 1 x Assassin's Creed 4 Black Flag Pirate Hidden Blade Cosplay Edward Kenway Gauntlet. Assassins creed IV 4 black flag pirate hidder blade gauntlet cosplay replica. Although the top blade is soft, but avoid to use it towards people's face. MCFARLANE TOYS ASSASSIN'S CREED AGUILAR'S HIDDEN BLADE Cosplay (2016). Condition is Used. NY Priority Mail, Get it in 3 days for Halloween! Condition is New. Decided i didnt want it anymore. 1 x Assassin's Creed Ezio Hidden Blade Auditore Gauntlet Replica. Great for collectibles and as gift to friends or relatives. Highly Detailed Replica of Ezio Auditore's Armored Vambrace. 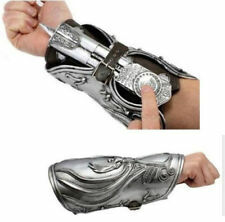 Highly Detailed Replica of Ezio Auditore's Armored Vambrace. 1 x Assassin's Creed Cosplay Replica. Great for collectibles and as gift to friends or relatives. Size: (not extended) length 21cm, extended length 38cm. Highly Detailed Replica of Ezio Auditore's Armored Vambrace. 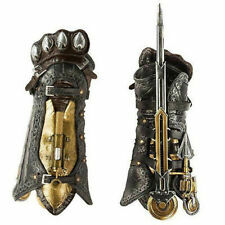 1 x Assassin's Creed Ezio Hidden Blade Auditore Gauntlet Replica. Great for collectibles and as gift to friends or relatives. 1 x Assassin's Creed 4 Black Flag Pirate Hidden Blade Cosplay Edward Kenway Gauntlet. Scale:1: 1. Color: Black. Size: one size. Great for collectibles and as gift to friends or relatives. Item itself is brand new. However, the box is a little rough around the corners. The item has been opened but never used. And possibly a Bandaid. We like you guys each in one piece. And we don't want you cutting your wrists, accidentally or on purpose. We should note that this also has a safety, so if you're clumsy like us and constantly setting it off, that's good news. Assassin's Creed blade from the movie. No sign of wear. Perfect for Halloween. Comee with box. Blade spring loaded. This life-size, role-play accessory lets fans wear the signature weapon of the heroic Assassins. It was chosen simply because it is short and has the word toy in it. The pronunciation is not Toy-N-K. This does not look like a cheap knock off. The velcro is still present. It still works and the velcro is present. Three Hidden blades from Assassins Creed 2, Assassins Creed Black Flags, and Assassins Creed Unity. Two are used and one is still in the box. Material: PVC. Size: 17" 11.4" 6.7" (43cm 29cm 17cm). Hours of Service . • Assassin's Creed Origins Hidden Blade Cosplay. • Wear the signature weapon wielded by Bayek with its dual blade upgrade. • Weight: 1.2 lbs. Product Specifications. Assassin’s Bracer with Hidden Blade this is for 14 not for use by children. Assassins Creed Origins Bracer W/ First Hidden Blade Bayek Replica CosplayCondition is Used. The blade on this can be a little hard to get back in at times but does go in. This item comes from a smoke-free home Shipped with USPS Priority Mail. Brand new in box! Box may have minor wear. 1 x Assassin's Creed 4 Black Flag Pirate Hidden Blade Cosplay Edward Kenway Gauntlet. 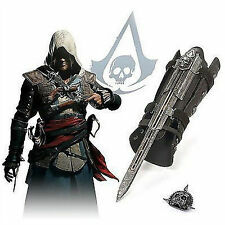 Assassins creed IV 4 black flag pirate hidder blade gauntlet cosplay replica. Scale:1: 1. Color: Black. Size: one size. Assassin's Creed Bracer. Don't be shy. If it will be delayed, I will let you know. New open box. Box shows wear. Contents are new. ASSASSIN'S BRACER WITH HIDDEN BLADE. ASSASSINS CREED ORIGINS. 1BRACER W/ HIDDEN BLADE. The object for sale is ONE item (unless otherwise indicated).